Something unusual is happening on farms in the small Central American nation of El Salvador. Many fields, mainly of sugar cane, are now being tended by drones. 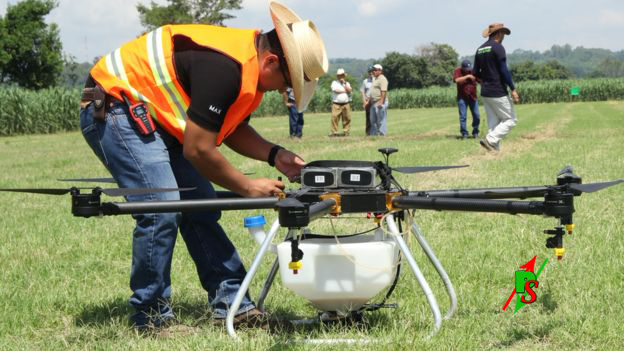 Large unmanned hexacopters fitted with 20-litre tanks for carrying fertiliser or pesticides follow pre-mapped routes and spray crops accordingly. This isn't a case of new tech replacing old farm equipment - some of these fields are being sprayed for the very first time. "We're spraying crops that previously have not being sprayed," says Nick Nawratil, chief operating officer of Hylio, the firm behind the trial. "That's one huge opportunity that drones are opening up." In a country where access to fields is often difficult for tractors and even planes, drones are showing great potential. Mr Nawratil thinks yields could improve by "tens of percent". At the moment, most of the work with farmers in El Salvador is trial-based, but Hylio is covering a lot of ground. Mr Nawratil says that in one morning a single spray team can service 40 hectares - roughly the same area as 40 international rugby pitches. He's seen for himself how much more quickly sugar cane, which can grow to be 20ft (6m) tall or more, shoots up after receiving fertiliser. Drones are touted as useful flying farmhands because they can, in theory, improve the precision with which fertilisers, pesticides or fungicides are applied. This is due to their ability to spray specific volumes on GPS-defined routes through a field. One South African farmer recently claimed that using drones reduced the pesticide use on her farm by 30%. This improved efficiency could go some way to allaying fears about the environmental damage that overuse of pesticides and fertilisers can cause, such as reduced biodiversity and the poisoning of aquatic life when chemicals run off into rivers after rain. For developing countries in highly competitive global agriculture markets, drones are clearly tempting. The Philippines recently announced that 5,000 hectares of vegetable farms would be used to test crop-spraying drones, for instance.